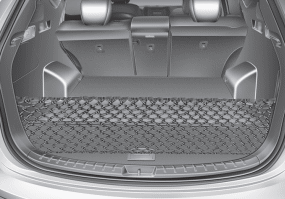 To keep items from shifting in the cargo area, you can use the four holders located in the cargo area to attach the luggage net. 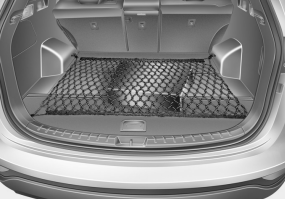 If necessary, contact your authorized HYUNDAI dealer to obtain a luggage net. Vehicles equipped with a luggage rail system may use the shackles to hook the luggage net. To avoid eye injury, DO NOT overstretch the luggage net. ALWAYS keep your face and body out of the luggage net’s recoil path. DO NOT use the luggage net when the strap has visible signs of wear or damage.